Avani Avittam is a most important ritual for Brahmins. It is a ceremony of changing the sacred thread (poonal). It is called Upakarma, and it is the most important 'Karma' (duty) for the one born as a BrahminThe celebration of Avani Avittam is a reminder of the spiritual significance of the sacred thread.Avani Avittam is celebrated with its own set of special food preparations. The important ones being the Neiyyappam the Paruppu Vadai and the Paal Payasam Morning Breakfast served with one sweet. So Today’s special I made this delicious seven cup sweet. Seven Cups Cake /Sweet is a delicious sweet that can be made with available ingredients in home. This sweet is called 7 cups because there is a 7 cup measure that is followed to prepare this recipe. All the 7 cups of ingredients are placed in a pan and that’s it, cook them all together to make this delicious treat. 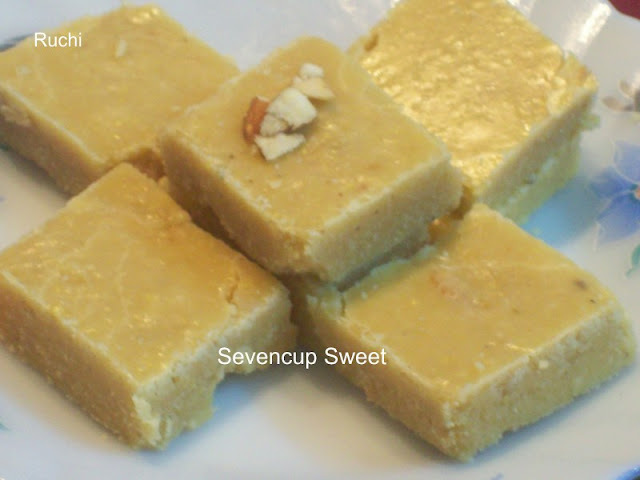 Seven cup burfi is a very simple sweet and easy to make in less time and a very good dish for all festivals. ,.It tastes similar to Mysore Pak. 1.Grease a tray with ghee and keep it ready. 2.Take a heavy bottom pan, add sugar & Stir until sugar is dissolved. 3.Grind coconut into smooth paste. Then mix gram flour in milk without any lumps. 4.Then Add this ingredients coconut paste, ghee ,milk& besan into sugar syrup stir continuously by keeping the flame low. 5.Slowly the mixture will get solidified and starts to leave the sides of the pan without sticking, then that is the right stage to remove the sweet from the flame. 6.Add the cardamom powder & switch off the stove. Then pour the entire mixture over the greasy plate Spread evenly. Allow to cool .Cut in to any desired Shape, Enjoy :). Highly irresistible and super tempting seven cup, makes me nostalgic.